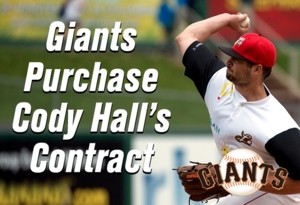 (Lancaster, Pa., June 27, 2017) - The San Francisco Giants have purchased the contract of right-handed reliever Cody Hall, returning him to the organization that originally signed him and brought him to the Major Leagues. He will report to the Giants’ Class AA affiliate in Richmond, VA.
Hall, 29, appeared in 27 games out of the Barnstormers bullpen. He compiled a 2-3 record with a 5.06 ERA but logged a staggering 48 strikeouts in 26 2/3 innings of work, an average of 16.2 strikeouts per nine innings. In the process, the right-hander from Baton Rouge, LA walked only four batters. After signing with the Giants out of Southern University in 2010, Hall reached the Major Leagues in his fifth professional season, appearing in seven games with San Francisco in 2015, covering 8 1/3 innings. He also worked two games at the big league level in 2016 with the Miami Marlins. Hall becomes the fifth member of the 2017 Barnstormers to have his contract purchased by a Major League organization, including a league-topping four in the month of June.